Driving around the West Avenue, Sunset Harbour, Belle Isle area of Miami Beach got a little easier this week with the opening of the West Avenue Bridge. 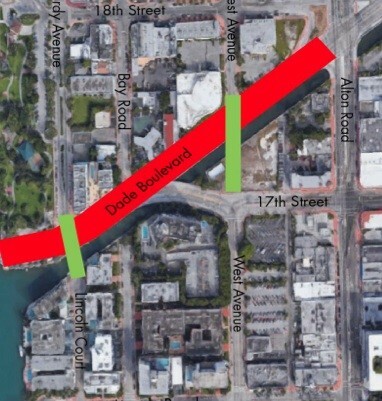 The new bridge extends West Avenue across Dade Boulevard over the Collins Canal between 17th and 18th Streets. Following resident input, it was designed to mimic the Venetian Causeway Bridge to its west. The bridge includes vehicle lanes, sidewalks, and bike lanes. “State-of-the-art traffic signals, rehabilitated roadway and seawall improvements help alleviate traffic congestion and reduce the potential for safety conflicts at the intersections of Dade Boulevard and Bay Road,” according to the City. “It has these great areas for bikes,” he added. “Can you imagine if you’re a biker and you’re trying to go from West Avenue over to Sunset Harbour? Literally you were taking your life in your hands crossing these areas here. Now you can go across this great bridge, go across this area here, which by the way is going to be painted green” similar to other bike lanes around the City. When you get to Dade Boulevard, signs indicate bicycles can use the full vehicle lane. A new pedestrian bridge is coming soon to the area connecting Lincoln Court on the south side of Dade Boulevard with Purdy Avenue on the north side of Collins Canal. After the ribbon cutting, Levine joined other City officials in riding in the first vehicle across the bridge, an antique fire truck.